Well, almost 2 weeks into the new year and things are rolling! I started this year thinking of changing my to-do app and well, turns out after some self-investigating, I realized I didn't dislike Remember the Milk, it's more about getting bored of how it looks. So after a bunch of research, I combined A Bit Better Remember the Milk - Tweaked user style (which I've been using for ages) with some custom CSS and it's finally fun to look at my to do list again. OK fun is exaggerating but it's not boring is what I mean. So far, the year has seen me pretty much do all the things I've expected it, from days where I feel empowered because things are flowing smoothly, to days I come home at night like a zombie and can't believe it's already been 24 hours. From being the guest speaker at executive luncheons to comedy gigs, to attending a friend's family funeral. It's only been 12 days and looking back at my schedule is exhausting but empowering. 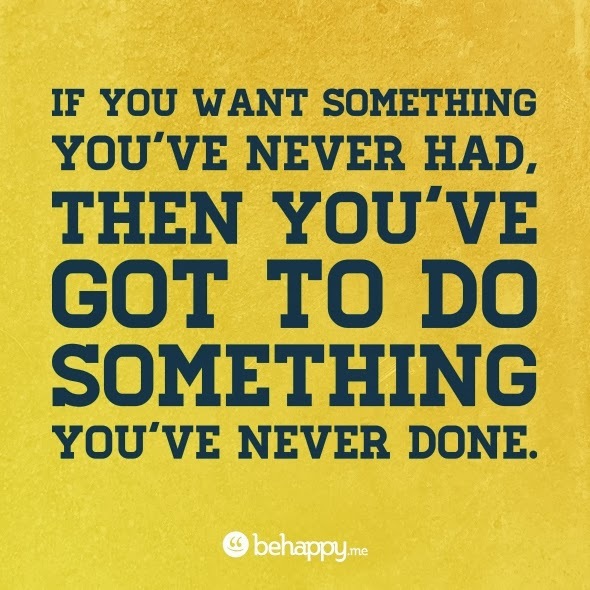 I recently came across the quote "If you want something you've never had, then you've got to do something you've never done". I believe it was said by Thomas Jefferson but I'm not 100% sure about that. Nonetheless, it makes sense to me a lot. I've always been an advocate of doing things different. It's paid off very well for me. Recently, someone asked me how I go about doing different things. Do I learn the ways things are done now, then have my own spin on it? Or basically go about things my own way, regardless of how things are done in general. Interesting, made me think about how I process items. After a good pondering, I realized very often I start something with certain assumptions. For example, I might think "surely, I'm not the only one who is thinking of doing something like this", then I go on the Internet and search my heart out. Eventually after a lot of research, I get to learn how the common way is, and then see if I can customize things to suit how I want them to be. So let's take my to do list. Remember the Milk, the general interface is very basic and personally I don't like it. My first thought was surely I'm not the only one who doesn't like this interface, so I started looking for people/posts online that discusses this issue. I ran into a whole bunch of user-customizations of the interface and had to experiment with each one until I found the A Bit Better Remember the Milk - Tweaked user style. At first, this served my purpose but over time, I realized I wanted a very minimalist and clean interface, so I went to do more research about this and found most minimalist styles weren't sufficient for my needs. Then I went about trying to see how exactly people were customizing the page and eventually came upon Stylish which is a Firefox plugin that allows you to customize the CSS of different web pages. Perfect, it allowed me to adjust the way the page looked. Perfect! Then came the next problem, if I customize things on my desktop, I want those same styles on my laptop. The typical way would be to copy and paste the code to my laptop's Firefox browser and I'm good. But knowing myself and my need to work hard to be lazy, I needed something more automated. Once again, in my head I was thinking surely I'm not the only one who's thinking this and back to research it is. I came across Stylish Sync which was exactly what I needed. Now my customized style is auto-sync'ed to my laptop and vice-versa and done! That way when I update the style on either device, it is sync'ed to each other so I don't need the tedious follow up process of copy and pasting the items. Now is this all that different? I don't think so, but this basically outlines that typical process I have for things I use and do. Very often I've found most people fear difference because it feels like a lot of work and change always means teething problems and new challenges, but I think I've always had the view that doing something different would always end up in an improvement, otherwise why change right? If it ain't broke, don't fix it. So if you shift that mentality, chances are you'll always be willing to try something new/different in hopes that it makes things better. And heck, even if it doesn't, now you know. You just became wiser.